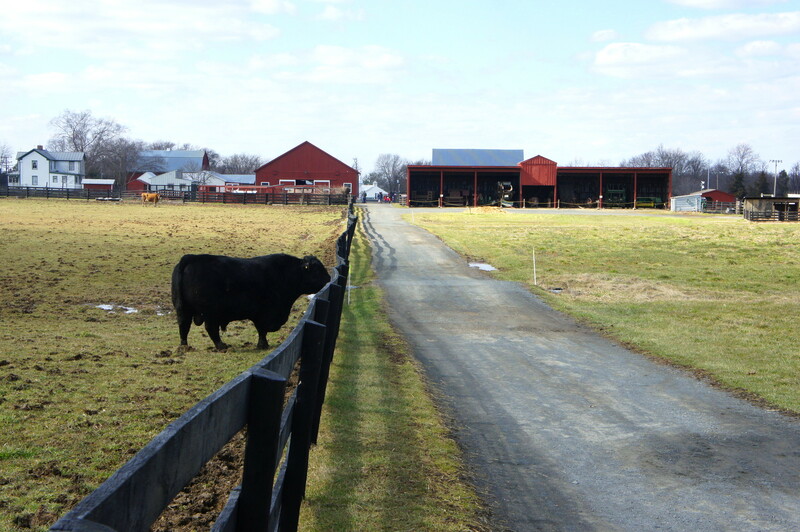 Frying Pan Farm Park in western Fairfax County, Virginia serves mostly as a destination for equestrians, school trips, and tractor rides, a family-friendly outing at a semi-rural farmstead. 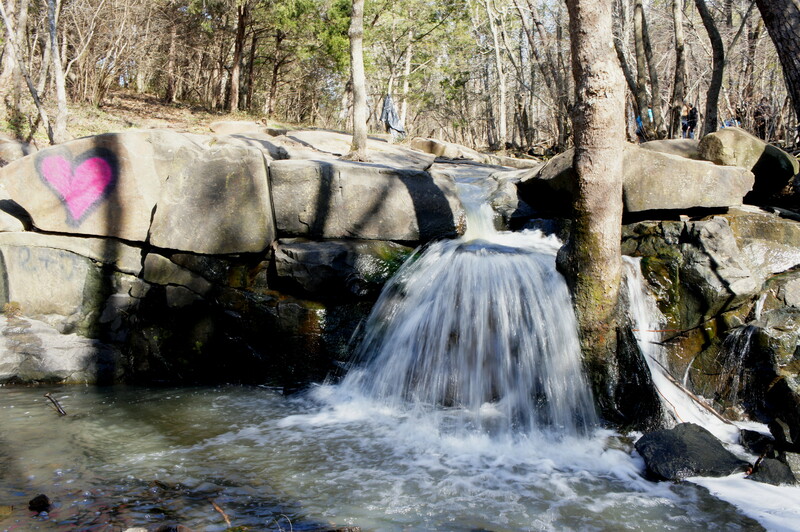 There is also a decent nature trail, however, featuring a handful of obscure historic landmarks and a pretty stream and waterfall. 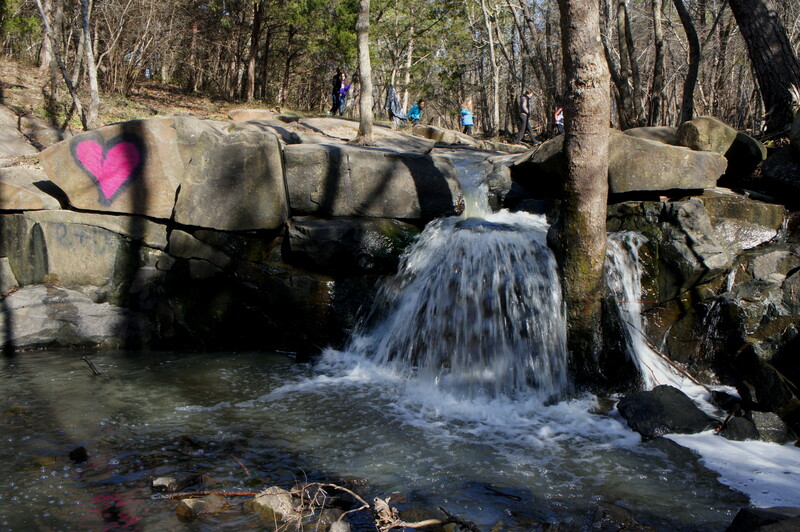 The following hike traces a 2.2-mile loop around the park, including two minor detours on the Meeting House Trail and a spur route through the boggy woods. It is probably easiest to start and end at the Frying Pan Farm Park Visitor Center, well-marked and situated off West Ox Road in Floris, Virginia. The center itself is a giant red barn, lined with neatly manicured trees and an L-shaped parking lot. Start the walk at the small wooden kiosk just off to the west of the Visitor Center, breaking through the trees and into the sunny farmland. Bear straight—heading toward the buildings of Kidwell Farm—to complete the kitschy section first. Passing cows on the left and crops on the right, the wide tractor path makes a beeline for the heart of Kidwell Farm, home to more than a dozen old buildings and relics of the 1930s farmstead. It’s part petting zoo, part amusement park: there are peacocks and turkeys and goats, as well as a playground and carousel. Kidwell Farm is also a destination of equestrians, featuring a large indoor arena and some outdoor rings. If you’re like me, you’ll want to get out of this oft-crowded area as quickly as possible. 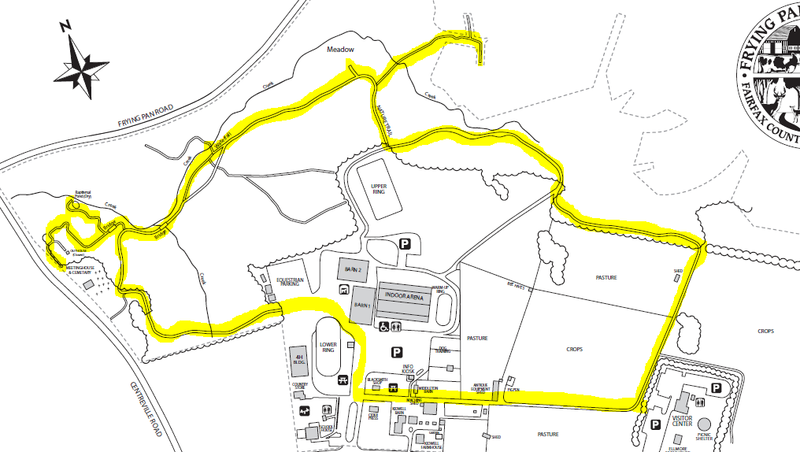 To do so, follow the westward path to the blacksmith shop, then bear right, skirting the edge of the parking lot for the indoor arena, then bearing left across the back parking lot (where the park stores its tractors and horse equipment). Look for the sign indicating “No Motorized Vehicles – Service Vehicles Only.” This is the access road to the start of the Nature Trail. The road weaves through woods then takes a sharp right turn, emptying out at a parking lot along Centreville Road. Straight ahead is the Frying Pan Spring Meeting House, a meeting place and field hospital for the Confederate Army during the early years of the Civil War. Bear right on the Nature Trail, finally leaving the graveled path behind, and drop down into a pleasant stream valley, where the route forks. Those with limited time should bear right to continue to the most interesting part of the hike; but the curious can turn left for a short detour on the Meeting House Trail. This walk provides access to a handful of semi-historic sites, like an old cemetery behind the Meeting House and the local baptismal font, now dry but situated in a pretty spot on the banks of the Frying Pan Branch of Horsepen Creek. Return the way you came, crossing over a small wooden bridge back to the Nature Trail. Walking the Meeting House Trail adds about 1/3 mile to your trip. 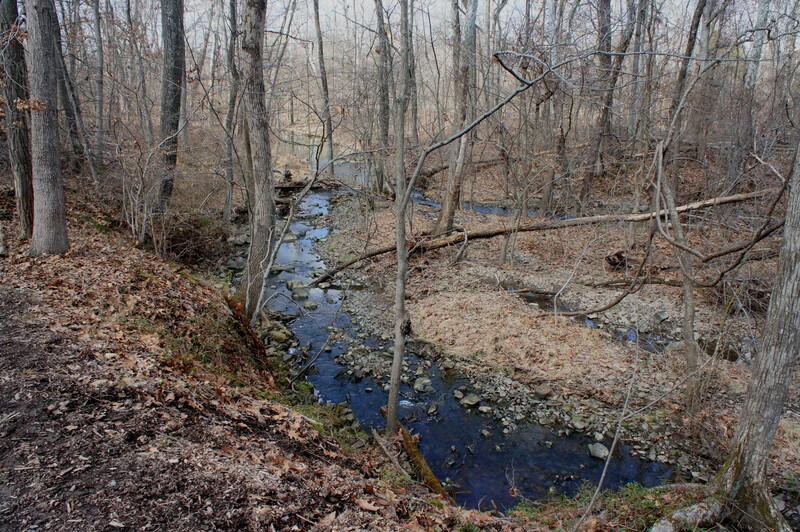 Bearing east on the Nature Trail, the route roughly follows the streambed and gets progressively rockier. It’s somewhat easy to get lost in this area, but as a general rule, follow the creek bed as the sound of rapids approaches. 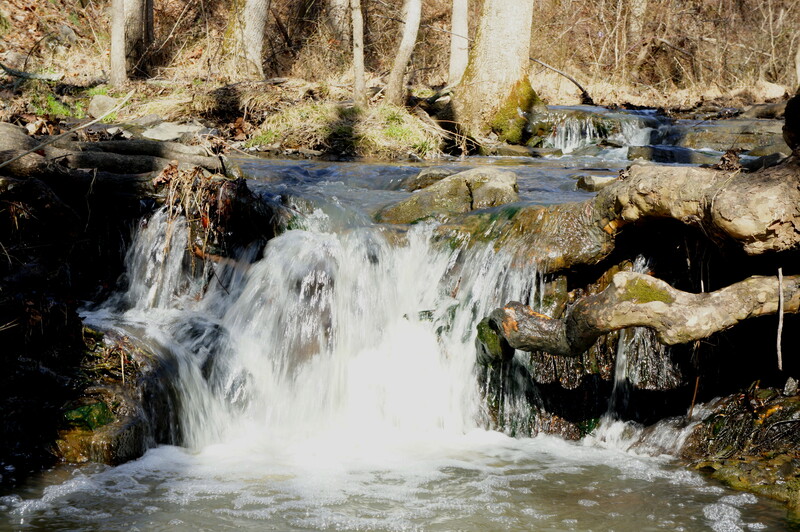 About 1/10 mile from the trail fork, it is possible (at least in winter) to go off-trail to reach a very small (1-2 foot) waterfall that is nonetheless quaint and picturesque. Back on the trail, bear left on an established route with red blazes that provides access to the creek and—just downstream—the true waterfall, this one about 4-5 feet high and cutting through a wedge in a wall of smooth grey stone. The obnoxious graffiti on the wall—a bright pink heart—is the only blemish. Return to the main nature trail, which is partially mulched and continues eastward. The trail quickly loses sight of the creek and climbs gradually uphill to another trail detour, this one a very short left to a small meadow. Shortly after the meadow, the trail curves right and splits. 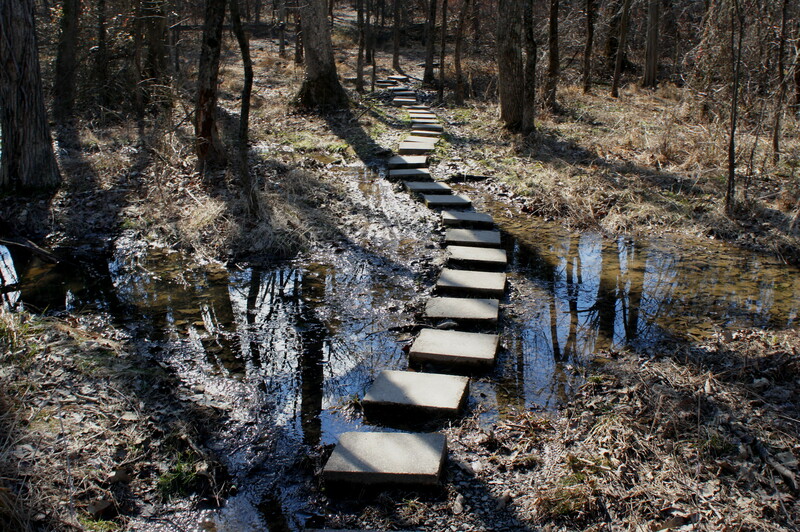 Bearing left, exactly 58 cement stepping stones offer passage through the bog, then—after crossing the now-trickling Frying Pan Branch—the trail turns to asphalt and offers access to a suburban neighborhood up the hill. Returning to the junction, continue southward (left) up the wide and mulched path to the end of the Nature Trail, which empties out onto a wide tractor road. Bear left, passing a wooden pen and the source of Frying Pan Branch. The path briefly emerges from the woods at another trail junction; continue left. A few hundred yards later, the trail approaches a man-made lake, while the main trail bears sharply right, out across the farmland again for the final leg of the circuit. It’s a straight shot from here back to the Visitor Center. 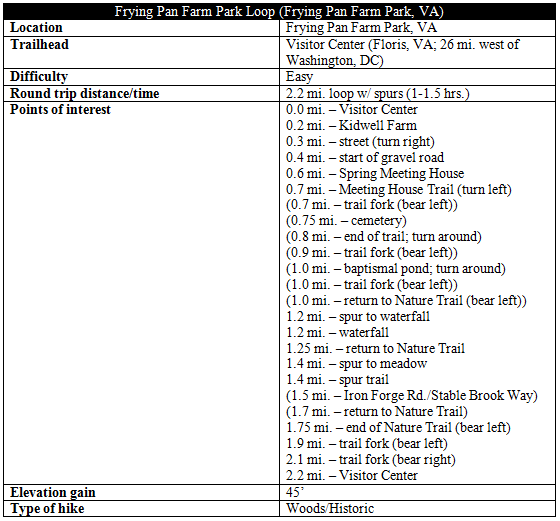 With all the detours, the entire walk comes to around 2.2 miles; without them, it’s around 1.6 miles—enough entertainment for an hour or two in a better-than-average Fairfax County Park. 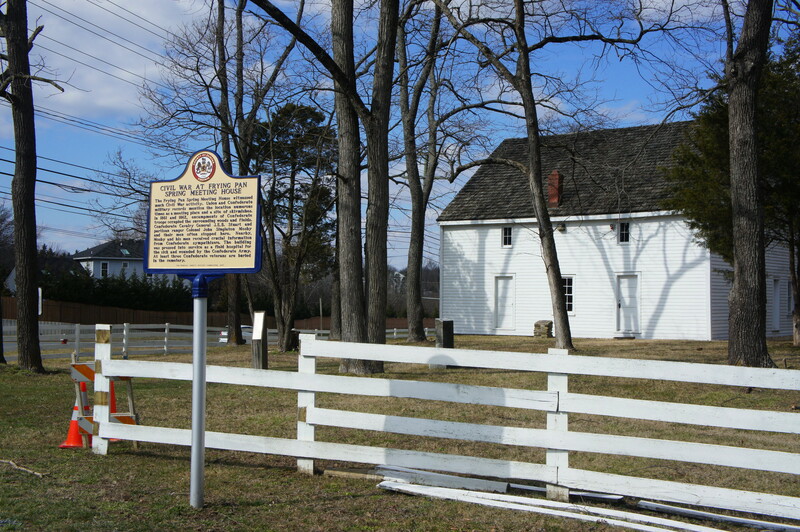 This entry was posted in Civil War, Easy Hikes, Fairfax County Parks, Virginia and tagged Civil War, Dulles, Fairfax County, Floris, Frying Pan Branch, Frying Pan Farm Park, historic, Kidwell Farm, loop hike, Meeting House Trail, Nature Trail, Virginia, waterfall. Bookmark the permalink.